The two groves of giant sequoia (also known as Sierra redwoods) contained within Calaveras Big Trees State Park are nearly the northernmost in California, second only to a tiny group next to the American River 60 miles further north. Calaveras has well over 1,000 mature sequoias, tucked into two moist, sheltered valleys on the west face of the northern Sierra Nevada, either side of the North Fork of the Stanislaus River. Visitors have been traveling to the North Grove at Calaveras since the 1850s, making this perhaps the longest established tourist facility in California; it became a state park in 1932. The groves are subtly different to the more famous sites to the south in the Yosemite, Kings Canyon and Sequoia national parks as the forest is more varied, home to several other types of trees as well as bushes, grasses and wildflowers; the southerly groves tend to be more uniform in tree composition and have less secondary growth. In this respect, Calaveras is more similar to the redwood forests of the far northwest. The state park is reached by Highway 4, a wide, quite busy route from Angels Camp in the west, though this narrows and becomes very steep and bendy further east, once past Bear Valley, as it crosses the Sierra crest at Ebbetts Pass then descends towards Carson Valley. 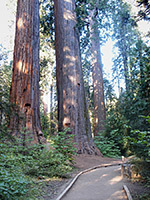 The entrance to Calaveras Big Trees State Park is on the south side of the highway 4 miles from the little town of Arnold, along a paved road that splits just after the toll booth; the left fork (closed by snow during the winter) passes one of the two campgrounds (Oak Hollow) and reaches the South Grove after 9 miles while the right road leads directly to the parking area for the North Grove, by far the most visited section. 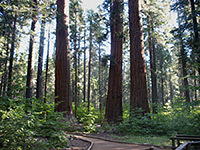 The main park campground is also located here, comprising 74 sites spread out along a loop through a mixed forest of sequoia and other trees, together with a collection of administrative buildings including a visitor center and a ranger station. The principal footpath is the level, wheelchair-accessible North Grove Trail (see below); there is also a very short interpretive nature trail, the elevated Grove Overlook Trail and the 4 mile River Trail which reaches the Stanislaus River after a steep descent of over 1,000 feet. As an alternative to the paid camp sites in the park (fees very high, at $35 per night in 2011), free camping places can be found along dirt tracks into the surrounding Stanislaus National Forest, a few miles east along Hwy 4. The nearest town with hotels is Angels Camp, 23 miles west. deep into the quiet, peaceful forest. Woodland along the path includes dozens of tall sequoias, as expected, but also many examples of four other large species (ponderosa pine, sugar pine, white fir and incense cedar), all of which are found in a full range of growth stages from young to mature, creating a healthy, flourishing environment. 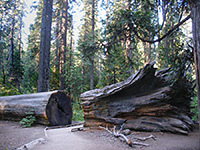 A trail guide is available describing 25 numbered points of interest including a selection of particularly large trees; the sequoia are a typical mixture of standing and fallen, large and small, burnt and undamaged, stumps and logs. Most visible wildlife are squirrels and chipmunks but black bears are also relatively common. 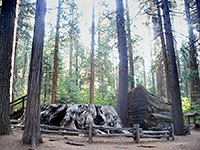 The North Grove Trail starts at Big Stump, next to the campground - this is a 25 foot diameter sequoia stump once used as a dancefloor, next to a equally wide sectioned log, and is perhaps the most striking sight in the whole north grove. These two relics are from the 280 foot tall Discovery Tree, formerly the largest in the area, and the first to be seen when the grove was discovered in 1852 by hunter Augustus T. Dowd. It was felled the very next year, whereupon its trunk was converted into a bowling alley and bar, much to the disgust of conservationist John Muir. Stop number 5 on the North Grove Trail is the Empire State Tree, believed to be the largest remaining in the grove, with a basal diameter of 30 feet. Number 13 is Father of the Forest, a huge specimen that fell several hundred years ago but still has a largely intact trunk. This has long been a celebrated photograph location, where people, horses and even troupes of cavalry would pose on the flat surface of the toppled giant. The path runs alongside for a way then passes Mother of the Forest (number 15), another sizeable tree whose bark was removed in 1854 and shipped to the east coast to convince sceptics of the existence and scale of the sequoias. Shorn of its protective coating the tree soon succumbed to fire, and now just a blackened trunk remains, still bearing visible marks of the crosscut saws used to strip the bark. At this point the path crosses a small stream (Big Trees Creek) and starts the return part of the loop, which is slightly spoilt by traffic noise, being quite close to Hwy 4 to the north. Stop 21 is, or was, at the Pioneer Cabin Tree, base of which was hollowed out in the 1880s to provide a competitive attraction to the newly popular California Tunnel Tree at Wawona. For many years the Calaveras tunnel tree was alive but only just; its growing top had long since fallen off to leave one solitary branch bearing a few green shoots, but then early in 2017 the sequoia finally toppled, following a storm. The road to the South Grove (the Walter W Smith Memorial Parkway) is a winding route, climbing and descending through several steep-sided valleys including that of the Stanislaus River, and ending at a parking area beside Beaver Creek. The 5 mile path around the grove crosses the creek and heads south up the hill on the far side to a junction at the start of the loop section. 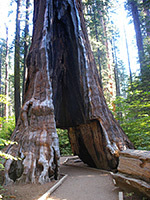 Owing to the remote location the sequoia in this area were not logged so are found in a more natural state than the North Grove, and are more widespread, numbering around 1,000 trees. The largest sequoia in the park is the 242 foot tall Agassiz Tree, at the end of a short spur trail. Another linked path is the Bradley Trail, a 2.5 mile loop through a newly planted group of sequoias.